All the establishments listed on this page are disabled friendly. as there are 3 main categories of disabled access (see links at bottom of this page). Winner in Scottish Hotel Awards 2019 for best B&B/Guest House in Highland region. AA Guest Accommodation of the Year 2005/2006 in Scotland. Voted Inverness Landlady of the Year 2001. Finalist in Highlands & Islands Tourism Awards 2017. Scottish Tourist Board and AA 5 Star Gold awards. and 'Staying off the Beaten Track in Scotland'. Luxurious lodge style house in rural setting. Stunning views over lower Nairn Valley. Set in 80 acres of peaceful pasture land. 5 miles south of Inverness city centre. Rooms: 4 double, 2 twin, 1 single (all ensuite). Master bedroom has 4-poster bed. Ideal for honeymoons. Discount for stays of 7 nights or more. Valid from 4 January to 30 April 2019. Instant online booking. Credit cards accepted. This historic inn features a restaurant and lounge bar. 9 miles from Inverness Airport. 2 miles from Nairn. 18 miles east of Inverness city centre. Ideal touring base. 20 golf courses within a short drive. 14 ensuite bedrooms with TV, etc. B&B prices from £30 per person. Brand new architect-designed house in Glen Nevis. Only 10 minutes walk from Fort William town centre. Just 100 metres from the end of The West Highland Way. Ideal for touring or outdoor activities. Family home offering superb Scottish hospitality. 2 ensuite bedrooms: 1 kingsize double & 1 twin. hairdryer, clock radio alarm and tea/coffee. Ramp for disabled access to the house. B&B prices from £30 per person per night. 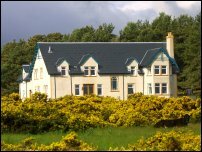 New beachside luxury guest house - VisitScotland 5 Gold Stars. 'Eat Scotland' Silver award winners. Situated overlooking the beach at Back. 15 minutes drive north of Stornoway. Ideal for holidaymakers or business travellers. Airport / ferry collection can be arranged. in the Highlands and Islands Tourism Awards. Choice of 4 spacious bedrooms (double/twin). and a private decking area. and fabulous views of the beach and sea (just 60 feet away). Breakfast and dinner are served in the dining room overlooking the bay. The guest house has an alcohol licence with an interesting wine & whisky list. PC & printer with Internet access. Free high speed wireless broadband. Loan of mountain bikes. Secure storage for surf boards & bikes. Special house party rates available for groups. (smoked salmon, cheese & meats). Credit cards accepted. Instant online booking. No smoking. No pets. No children under 14. Scottish Tourist Board 4 Star Guest House. 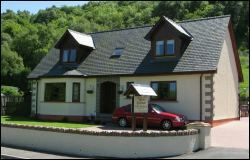 Situated on the shores of Lamlash Bay overlooking Holy Isle. Built in the late 18th century, now tastefully renovated and refurbished. Choice of 6 ensuite double/twin bedrooms. All with TV, hairdryer, central heating and hospitality tray. Four bedrooms with sea views. (and one is suitable for guests with mobility difficulties). Sitting room and dining room overlooking the bay. Sun lounge overlooking the garden. Breakfasts feature local produce. Vegetarians welcome. Enquire about single occupancy rates. 5 Star luxury stone cottages overlooking Scarista beach and the ocean beyond. Leverburgh 3 miles. Rodel 6 miles. Tarbert 15 miles. 2 bathrooms (one with Jacuzzi® & small sauna, other with steam shower). Lounge with large TV, DVD, CD, WiFi. Air to Air and underfloor heating. A well behaved dog welcome on request. Bikes and kayaks to rent nearby. Close to Scarista golf course. includes electricity, bed linen and towels. Short breaks off-season (November - March). the 'Clisham' can be seen from the cottage. 4 star quality cottage for up to 6 people. Freshly decorated with attractive artwork throughout. 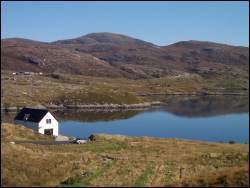 Spectacular location overlooking Ardhasaig Bay & the North Harris hills. and nearby restaurant at Ardhasaig House Hotel. 3 miles north of Tarbert (ferry from Skye). 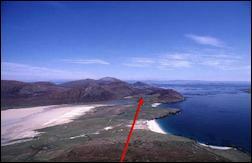 Centrally located for touring both Lewis and Harris. 2 double bedrooms (one en-suite), 1 twin bedroom & bathroom. Spacious lounge with TV, VCR, DVD player, music centre, games, books, etc. microwave and washing machine with drier. Total control electric heating. Wooden flooring throughout. Outdoor wooden decking with seating. Private washing line. Ample car parking. Out-house for storage of bicycles, etc. and is suitable for disabled persons. 2 luxury lodges each with 3 bedrooms, sleeping 5 - 6. Fully equipped including bed linen and towels. Mill Lodge has 2 twin bedrooms & 1 single room. 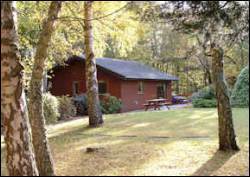 Burnside Lodge has 2 twin bedrooms & 1 bunk room with adult sized bunks. and grabrails in the bathroom). Lounge area with digital TV, DVD player. washing machine, tumble drier, coffee maker, toaster, etc. Private gardens with picnic tables. Lots of local wildlife. Prices from £335 - £530 per week. Courtyard conversion sleeping 5 people. On a 240-acre farm with panoramic views and woodland walks. Excellent touring base. Glasgow 20 miles. Stirling 15 miles. Falkirk Wheel 8 miles. Edinburgh 30 miles. Day trips possible to Perth, Loch Lomond and The Trossachs. The Kelpies, the Falkirk Wheel and the Antonine Wall are all nearby. Furnished and equipped to a very high standard. 1 ensuite superking double bedroom. Freeview TVs in both bedrooms. Large open plan lounge/dining/kitchen area. fridge/freezer, double oven, microwave, dishwasher. New conservatory and outside seating area. Central heating. Payphone. Disabled access. Prices: £410 - £750 per week. Short breaks from 3 - 6 days are sometimes available. Credit cards accepted. No smoking. Choice of 2 modern detached bungalows. in the quiet crofting community of Melvaig, near Gairloch. 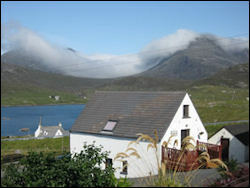 The houses overlook the sea, with views of Skye, Harris and Lewis. 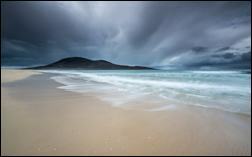 20 minutes from Gairloch. Torridon 40 miles. Ullapool 65 miles. 1 double bedroom & 1 twin bedroom. digital TV, DVD, CD player. fridge, freezer, washing machine, tumble dryer. Ramp access and wide doorways for wheelchairs. including electricity, bedlinen and towels. 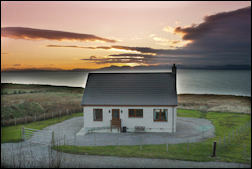 Luxury self catering Hebridean style house. 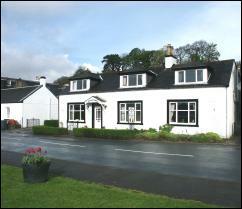 at Diracleit 2 minutes drive from Tarbert. Stunning views across East Loch Tarbert to Scalpay & Skye. 10 minutes drive from the west coast sandy beaches. Guests have free access to Harris Golf Club. Scottish Tourist Board 5 Stars. 2 ensuite bedrooms upstairs (1 twin & 1 kingsize). 1 ground floor double room (with disabled access). 1 luxury bathroom with sauna and deep spa bath. Open plan living/dining/kitchen area & upstairs play area. telephone with up to �15 usage per week. microwave, ceramic hob, electric oven, etc. Extra z-bed and cot available for young children. Category 2 assisted wheelchair access. fishing rods, barbecue, picnic equipment. includes electricity, linen, towels, bath robes. Credit cards accepted. No pets. No smoking. on the edge of Shiskine village. Lovely views across open countryside to the hills beyond. 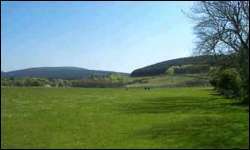 Less than 2 miles from Blackwaterfoot (golf, restaurant, pool, etc). Less than 10 miles from Brodick. 17 miles from Lochranza. Lounge with TV, DVD player, hi-fi & pull down double futon. Kitchen with cooker, fridge/freezer, dishwasher, microwave, etc. Large shared garden with patios & garden furniture (BBQ available). An acre of woodland at the rear of the property. 3 night short breaks from £240. Pets arrangement only. Strictly no smoking. VisitScotland, the national tourist board, checks accommodation and attractions for accessibility, and this information is included on their web site. Click here to search their accommodation database by location and degree of accessibility. All accommodation and attractions listed are part of VisitScotland's grading schemes. You can also call them on 0845 22 55 121 or email VisitScotland via their web site. Blue Badge parking guide - searchable maps for holders of the disabled 'blue badge' showing accessible public toilets, disabled parking bays, etc. The Association of Scottish Visitor Attractions lists contact details for over 400 places - email them about disabled access to the properties you want to visit. Capability Scotland which offers an Advice Service at 11 Ellersly Road, Edinburgh EH12 6HY. Tel: 0131 313 5510. Fax: 0131 346 1681. Nevis Mobility offers mobility equipment for hire (mobility scooters, wheelchairs and walkers). Collection/delivery anywhere in the Glasgow/Edinburgh area. Tel: 01698 711103.